Not to be confused with Matt Stryker. After training with Johnny Rodz, Kaye began working on the American independent circuit. While working full-time as a teacher in 2004, he continued to wrestle during his vacation time and weekends, while also using sick days. On December 16, 2004, Striker began a tour of Japan with Pro Wrestling Zero1 and was later invited back for an extended tour in early 2005. After resigning from his teaching position, he continued to wrestle around New York, and on April 30, 2005, won the New York Wrestling Connection (NYWC)'s Heavyweight Championship by defeating Mike Mondo. A few weeks later, on May 21, while still the Heavyweight Champion, he defeated Joey Braggiol to win the NYWC Interstate Championship, but only held the championship for two weeks, before losing it back to Braggiol on June 4. He made a few appearances for Ring of Honor in mid-2005, before returning to NYWC to lose the Heavyweight Championship to Jerry Lynn on July 30, after holding it for four months. He continued to wrestle for independent promotions throughout mid-2005, until he signed a contract with WWE. Kaye, using the name Matt Martel, wrestled Kurt Angle in an invitational match on the February 24, 2005 episode of SmackDown! in Philadelphia, Pennsylvania. After the revelation that Kaye was a teacher appeared in mainstream news publications, Kaye made a WWE second appearance on the July 11, 2005 episode of Raw to face Angle for a second time. His news coverage was played up by Angle, who once again defeated Kaye. The following week, Angle defeated him for the third consecutive time. Kaye, now known as Matt Striker, went on to compete on Heat and appear in WWE's developmental territory, Deep South Wrestling. Striker developed a heel (villainous) teacher persona and beginning on December 12, hosted a segment called Matt Striker's Classroom on Raw. During the segments, he ridiculed the audience and treated the crowd as intellectual inferiors. On April 24, he participated in a six-man tag team match, in which he, Chris Masters and Shelton Benjamin were defeated by Carlito, Rob Van Dam, and Charlie Haas. During the Backlash pay-per-view, Striker hosted an edition of his Classroom segment, which ended when Eugene, who in storyline was mentally impaired, attacked Striker. Striker, in retaliation, attacked Eugene with a dictionary the following night on Raw. The feud between the two ended when Eugene gained a mentor in "Hacksaw" Jim Duggan and defeated Striker. Striker appeared only rarely on Raw throughout June and July, and his final match for the brand was on July 31, when he was quickly defeated by John Cena. At the end of August 2006, Striker left the Raw brand to join ECW, making his debut on August 23. He continued his Classroom segment on ECW, which provoked a feud with The Sandman after Striker insulted him. Striker made his in-ring debut for the brand on the September 19, 2006 episode of ECW, when his team of Mike Knox and Test were defeated by Tommy Dreamer, Sabu, and The Sandman when Test was disqualified for pushing the referee. Striker continued his feud with The Sandman until the October 17 episode of ECW, when The Sandman defeated him in a Singapore Cane on a Pole match. On February 6, Striker aligned himself with Mr. McMahon's New Breed stable, along with Elijah Burke, Kevin Thorn, and Marcus Cor Von. The New Breed immediately engaged themselves in a feud with the ECW Originals (Rob Van Dam, Tommy Dreamer, Sabu and The Sandman). At WrestleMania 23, the New Breed was defeated by the ECW Originals in an 8-man tag team match, but won a rematch on the following episode of ECW. In the midst of the feud, tension began to appear between the leader Elijah Burke and Striker, after Striker and Cor Von were defeated by the debuting Major Brothers. As a result, Striker began trying to avenge the loss to the Major Brothers and defeated Brett Major on the May 22 episode of ECW. The feud with the Originals lost momentum, however, as Sabu was released from his WWE contract in mid-May, and the feud ended at the One Night Stand pay-per-view, when Striker, Cor Von, and Burke lost to Dreamer, Sandman, and CM Punk in a tables match. On June 12, Striker was defeated by The Boogeyman in a singles match, and two weeks later, The Boogeyman attacked him during an edition of Piper's Pit. On July 10, Striker invited Boogeyman to the ring, allowing the debuting Big Daddy V to attack him. Striker then formed an alliance with Big Daddy V that lasted until March 2008, acting as Big Daddy V's manager and regularly accompanying him to the ring. In November, Striker and Big Daddy V started a feud with Kane, after Kane attacked Striker. Striker and Big Daddy V wrestled Kane in a handicap match, and the pair also aligned briefly with Mark Henry. Henry helped Big Daddy V win a match against Kane on the November 27 episode of ECW, and in return, Striker refereed a match between Henry and The Undertaker, refusing to count a pinfall against Henry. As part of the 2008 WWE Supplemental Draft in June 2008, Striker was drafted back to the Raw brand. After a brief stint, Striker returned to ECW to take over duties as color commentator, debuting on August 5. Striker and his commentary partner, Todd Grisham, won the 2008 Slammy Award for the Announce Team of the Year for 2008. In April 2009, however, Grisham was moved to the SmackDown brand, and Josh Mathews debuted as the new play-by-play commentator. In addition to commentating on ECW on SyFy and ECW pay-per-view matches, Striker and Mathews represented the ECW brand on WWE Superstars every week. 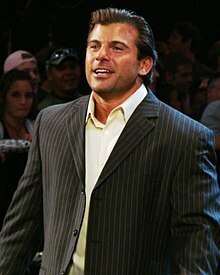 On October 27, 2009 it was announced that Striker would move from commentary on ECW to SmackDown, reuniting with Grisham. The move was made to help accommodate Jim Ross, who had been taking time off to deal with his recent Bell's palsy attack. The following October, Striker and Grisham were joined by Michael Cole on SmackDown, forming a three-man announce team. Striker, however, was replaced in early February 2011 by Booker T.
Striker began hosting NXT in early 2010. He wrestled his first match in three years on the August 2, 2011 episode of NXT, teaming with Titus O'Neil in a winning effort against Derrick Bateman and Darren Young in a tag team match. He fought Young in the next two weeks, but Young emerged victorious both times. Striker later teamed up with William Regal to face Young and JTG, but Striker and Regal were unsuccessful. Meanwhile, as NXT host, Striker was frequently bullied by Curt Hawkins and Tyler Reks, The storyline included his "kidnapping" on the March 21 episode of NXT Redemption by unknown persons, later revealed to be Hawkins and Reks. During this time, Striker also continued to commentate on Superstars, with the explanation given being that to keep his kidnapping a secret, WWE hired a body double to assume Striker's duties. Striker was later "rescued" on the April 11 episode NXT Redemption. Striker ceased his role as NXT host with the conclusion of NXT Redemption. After hosting NXT, Striker began interviewing WWE employees on Raw and SmackDown. During the summer of 2012, Striker became the host of WWE Afterburn for international broadcasts. On the October 12 SmackDown, Striker tried to interview Team Hell No (Kane and Daniel Bryan), but they both attacked him. On the October 15 episode of Raw, Striker demanded that he receive an apology and was instead forced to face Kane in his final WWE match, which Striker lost. On June 20, 2013, Striker departed WWE after the company opted to not renew his contract. On June 21, Striker made his first post-WWE appearance, by appearing on Family Wrestling Entertainment iPPV, FWE Rumble in Queens, New York as a color commentator. On October 21, 2013, Striker was defeated by Justin Credible in NYWC's House of Madness. After the match, Striker nailed Credible, causing him to bleed. Backstage, Striker tried to apologize but Credible cursed him out in the locker room and stormed off. On July 2013, Championship Wrestling from Hollywood (CWFH) announced Striker as the new announcer of the promotion on MAVTV. On November 2, 2013, Striker made his in ring debut for CWFH, unsuccessfully challenging Scorpio Sky for the CWFH Heritage Heavyweight Championship. On March 14, 2014, Striker took part in German promotion Westside Xtreme Wrestling's 16 Carat Gold weekend. On March 15, Striker and Trent? defeated Hot & Spicy (Axel Dieter Jr. and Da Mack) to win the wXw World Tag Team Championship. They lost the title to Hot & Spicy the following day. From July 18 to August 2, 2014, Striker took part in Pro Wrestling Noah's 2014 NTV G+ Cup Junior Heavyweight Tag League, where he and partner Super Crazy finished with a record of two wins and two losses, failing to advance to the finals. On September 5, 2014, it was reported that Striker had signed with Lucha Underground as the lead English language announcer, alongside Vampiro. Striker and Vampiro have provided English language commentary since the show's debut. Striker, along with Vampiro, served as one half of the English language commentators for AAA's Lucha Libre World Cup internet pay-per-view on May 24, 2015. On August 9, 2015, Striker returned to AAA English language commentary alongside Hugo Savinovich for AAA's Triplemanía XXIII pay-per-view. Striker and Jim Ross served as the English language commentators for New Japan Pro Wrestling (NJPW)'s Wrestle Kingdom 9 in Tokyo Dome pay-per-view on January 4, 2015. On October 12, Striker returned to NJPW to provide English commentary on King of Pro-Wrestling, this time working alongside long-time Ring of Honor commentator Kevin Kelly. The following year, Striker returned to NJPW English commentary at Wrestle Kingdom 10 in Tokyo Dome on January 4, 2016, again working alongside Kelly, as well as NJPW wrestler Yoshitatsu. Kaye was a child actor and had roles in the films Wise Guys and Child Savers. In 2011, Kaye appeared in the films Big Fat Gyspy Gangster and Tezz in uncredited roles. Kaye earned a Bachelor's degree in History and went on to obtain a Master's degree in educational psychology. He began working as a high school teacher after college. He worked part-time as a substitute, filling in when other teachers were on leave. In mid-2004, he was hired full-time as a social studies teacher at Benjamin N. Cardozo High School in Queens, New York, but wrestled part-time during his vacation time and on weekends. wXw World Tag Team Championship (1 time) – with Trent? ^ a b c d e f g h i j k l m n o p q r s t u v Milner, John M. "Matt Striker". Slam! Sports. Canadian Online Explorer. Retrieved April 25, 2010. ^ a b c d "Matt Striker Profile". IGN. Archived from the original on July 13, 2011. Retrieved April 26, 2010. ^ a b c d e "Matt Striker biography". World Wrestling Entertainment. Retrieved December 12, 2009. ^ Meltzer, Dave (December 28, 2011). "Wed. update: Punk, ROH surgery, Tokyo Dome; Raw rating, Dixie Carter, Madden, ROH, UFC fights". Wrestling Observer Newsletter. Retrieved December 29, 2011. ^ Striker, Matt (January 12, 2005). "Three Years Ago..." Pro Wrestling Zero1. Archived from the original on May 4, 2010. Retrieved April 26, 2010. ^ a b c "History of the NYWC Championship". New York Wrestling Connection. Archived from the original on July 14, 2011. Retrieved April 26, 2010. ^ a b "History of the NYWC Interstate Championship". New York Wrestling Connection. Archived from the original on July 14, 2011. Retrieved April 26, 2010. ^ Plummer, Dale (February 25, 2005). "Smackdown: JBL's party gets crashed". Slam! Sports. Canadian Online Explorer. Retrieved June 1, 2017. ^ a b c Herszwnhorn, David M. (July 1, 2005). "Skipping Class to Wrestle, Teacher Lands in Trouble". The New York Times. Retrieved February 3, 2008. ^ a b Pefferman, Ray (July 12, 2005). "Raw: Michaels avoids the question; Matt's back". Slam! Sports. Canadian Online Explorer. Retrieved February 5, 2009. ^ Tylwalk, Nick (July 19, 2005). "Raw: Hogan accepts HBK's challenge". Slam! Sports. Canadian Online Explorer. Retrieved February 5, 2009. ^ a b Plummer, Dale (December 13, 2005). "Raw: Stars battle for 'chamber' spot". Slam! Sports. Canadian Online Explorer. Retrieved February 5, 2009. ^ Plummer, Dale (April 25, 2006). "Raw: Getting into the Backlash Spirit". Slam! Sports. Canadian Online Explorer. Retrieved February 5, 2009. ^ Elliott, Brian (May 1, 2006). "Heaven can't help Backlash". Slam! Sports. Canadian Online Explorer. Retrieved February 5, 2009. ^ Plummer, Dale (May 2, 2006). "Raw: Styles tells it like it is". Slam! Sports. Canadian Online Explorer. Retrieved February 5, 2009. ^ Plummer, Dale (June 6, 2006). "Raw: A legendary (killer) return". Slam! Sports. Canadian Online Explorer. Retrieved February 5, 2009. ^ Plummer, Dale (August 1, 2006). "Raw: Orton Knows Best". Slam! Sports. Canadian Online Explorer. Retrieved February 5, 2009. ^ MacKinder, Matt (August 23, 2006). "ECW: Many matches, better show". Slam! Sports. Canadian Online Explorer. Retrieved April 26, 2010. ^ MackKinder, Matt (August 30, 2006). "ECW: Heyman pins Sabu". Slam! Sports. Canadian Online Explorer. Retrieved April 26, 2010. ^ Lindsey, Jessie (September 6, 2006). "ECW: DX survives the Big Show". Slam! Sports. Canadian Online Explorer. Retrieved April 26, 2010. ^ Tello, Craig (September 19, 2006). "Taken to royal extremes". World Wrestling Entertainment. Retrieved February 3, 2008. ^ MacKinder, Matt (October 4, 2006). "ECW: RVD can't pass the Test". Slam! Sports. Canadian Online Explorer. Retrieved April 26, 2010. ^ MacKinder, Matt (October 17, 2006). "ECW: RVD's last chance". Slam! Sports. Canadian Online Explorer. Retrieved April 26, 2010. ^ MacKinder, Matt (February 7, 2007). "ECW: Vince shows up again". Slam! Sports. Canadian Online Explorer. Retrieved April 26, 2010. ^ MacKinder, Matt (February 14, 2007). "ECW: Originals vs. New Breed". Slam! Sports. Canadian Online Explorer. Retrieved April 26, 2010. ^ MacKinder, Matt (February 21, 2007). "ECW: Triple Threat for Lashley". Slam! Sports. Canadian Online Explorer. Retrieved April 26, 2010. ^ Plummer, Dale; Tylwalk, Nick (April 15, 2007). "Undertaker the champ, McMahon bald". Slam! Sports. Canadian Online Explorer. Retrieved February 5, 2009. ^ MacKinder, Matt (May 2, 2007). "ECW: The New Breed crumbling". Slam! Sports. Canadian Online Explorer. Retrieved April 26, 2010. ^ Writer X (May 9, 2007). "ECW: New Breed kind of night". Slam! Sports. Canadian Online Explorer. Retrieved April 26, 2010. ^ Waldman, Jon (May 15, 2007). "ECW Original, Sabu, among Tuesday releases". Slam! Sports. Canadian Online Explorer. Retrieved April 26, 2010. ^ MacKinder, Matt (June 3, 2007). "One Night Stand a PPV gong show". Slam! Sports. Canadian Online Explorer. Retrieved April 26, 2010. ^ MacKinder, Matt (June 12, 2007). "ECW: "Remembering" Mr. McMahon". Slam! Sports. Canadian Online Explorer. Retrieved April 26, 2010. ^ MacKinder, Matt (June 25, 2007). "ECW: Tuesday Nitro era begins". Slam! Sports. Canadian Online Explorer. Retrieved April 26, 2010. ^ MacKinder, Matt (July 10, 2010). "ECW: Originals do the job". Slam! Sports. Canadian Online Explorer. Retrieved April 26, 2010. ^ MacKinder, Matt (August 26, 2007). "ECW: Balls McMahon?". Slam! Sports. Canadian Online Explorer. Retrieved April 26, 2010. ^ MacKinder, Matt (September 18, 2007). "ECW: Elimination Chase begins". Slam! Sports. Canadian Online Explorer. Retrieved April 26, 2010. ^ Bishop, Matt (November 14, 2007). "ECW: Invasion of other brands continues". Slam! Sports. Canadian Online Explorer. Retrieved April 26, 2010. ^ Bishop, Matt (November 21, 2007). "ECW: Benji debuts, Thorn's back, girls fight". Slam! Sports. Canadian Online Explorer. Retrieved April 26, 2010. ^ Bishop, Matt (November 28, 2007). "ECW: Kane and Big Daddy V get extreme". Slam! Sports. Canadian Online Explorer. Retrieved April 26, 2010. ^ McNamara, Andy (January 4, 2008). "Smackdown: Mysterio beats the clock". Slam! Sports. Canadian Online Explorer. Retrieved April 26, 2010. ^ Waldman, Jon (August 9, 2008). "Smackdown: A kiss from a rose". Slam! Sports. Canadian Online Explorer. Retrieved April 26, 2010. ^ Bishop, Matt (August 6, 2008). "ECW: Verbal duel inspired by Conan". Slam! Sports. Canadian Online Explorer. Retrieved April 26, 2010. ^ a b "2008 Slammy Awards". World Wrestling Entertainment. Retrieved December 17, 2008. ^ "Let the Chase to Backlash begin". World Wrestling Entertainment. Retrieved April 7, 2009. ^ Bishop, Matt (April 7, 2009). "ECW: Changes starting already". Slam! Sports. Canadian Online Explorer. Retrieved April 26, 2010. ^ Ross, Jim (April 15, 2009). "Draft Thoughts...Another Von Erich to Enter the Ring? ?...Steamboat to put tights back on?? WGN." J.R.'s Family Bar-B-Q. Retrieved April 18, 2009. All three brands will be featured weekly and each brand's announcers will call their respective bouts. ^ Martin, Adam (October 28, 2009). "Changes with WWE commentary". WrestleView. Retrieved October 28, 2009. ^ Hillhouse, Dave (October 2, 2010). "Smackdown: Live from Oklahoma City, it's Friday night!". Slam! Sports. Canadian Online Explorer. Retrieved February 5, 2011. ^ Bishop, Matt (February 5, 2011). "Smackdown: Edge and Del Rio avoiding collision course". Slam! Sports. Canadian Online Explorer. Retrieved February 5, 2011. ^ James, Justin. "JAMES'S WWE NXT REPORT 8/2: Alt. perspective review of NXT Week 22, overall show Reax". PW Torch. Retrieved September 14, 2013. ^ James, Justin. "JAMES'S WWE NXT REPORT 8/9: Alt. perspective review of NXT Week 23, overall show Reax". PW Torch. Retrieved September 14, 2013. ^ Caldwell, James. "CALDWELL'S WWE NXT RESULTS 8/16: Complete "virtual time" coverage of NXT Season 5, Week 24 – Maxine is back, strong in-ring action". PW Torch. Retrieved September 14, 2013. ^ James, Justin. "JAMES'S WWE NXT REPORT 9/13: Alt. perspective review of NXT Week 28, overall show Reax". PW Torch. Retrieved September 14, 2013. ^ Walek, Gregory. "NXT Results – 2/8/12". WrestleView. Archived from the original on February 16, 2012. Retrieved September 14, 2013. ^ James, Justin. "JAMES'S WWE NXT REPORT 3/21 – Week 55: Kidd vs. McGillicutty main event, bizarre episode with kidnapping & Regal foot massage, Overall Reax". PW Torch. Retrieved September 14, 2013. ^ James, Justin. "JAMES'S WWE NXT REPORT 4/4 – Week 57: Bateman-McGillicutty main event, physical Divas match, NXT love stories continue, Regal applies the law". PW Torch. Retrieved September 14, 2013. ^ Trionfo, Richard. "WWE NXT REPORT: DARREN LIKES TAMINA, BUT DOES TAMINA LIKE DARREN BACK? FIND OUT IN STUDY HALL; HUNICO IN ACTION; MAXINE AND JOHNNY CONTINUE TO LOOK FOR STRIKER". PWInsider. Retrieved September 14, 2013. ^ James, Justin. "JAMES'S WWE NXT REPORT 4/11 – Week 58: Kidd-McGillicutty best-of-three conclusion, kidnapping caper, Regal Logic". PW Torch. Retrieved September 14, 2013. ^ James, Justin. "JAMES'S WWE NXT REPORT 6/13 – Week 67: Final episode of Season 5, WWE introduces FCW stars for Season 6, Usos close out the season". PW Torch. Retrieved September 14, 2013. ^ "WWE News: FCW name being phased out". Wrestling Observer Newsletter. Retrieved September 14, 2013. ^ James, Justin. "JAMES'S WWE NXT REPORT 6/20 – Week 1 of new season: Kidd vs. McGillicutty main event, Ross & Regal on commentary". PW Torch. Retrieved September 14, 2013. ^ Cupach, Michael. "CUPACH'S SMACKDOWN REPORT 10/12: Alt. perspective review of Orton's return, curious booking decisions, Overall Mike's Reax". PW Torch. Retrieved September 14, 2013. ^ Caldwell, James. "CALDWELL'S WWE RAW RESULTS 10/15: Complete "virtual-time" coverage of live Raw – what was McMahon's "decision?," ten matches". PW Torch. Retrieved September 14, 2013. ^ Johnson, Mike. "WWE ANNOUNCER GONE". PWInsider. Retrieved September 14, 2013. ^ Johnson, Mike. "MATT STRIKER'S FIRST POST-WWE APPEARANCE WILL BE..." PWInsider. Retrieved September 14, 2013. ^ "ALEX SHELLEY INJURY UPDATE, ISSUE BETWEEN FORMER WWE STARS OVER WEEKEND, GAGNE HONORED, FUNKS REUNITE AND MORE". PWInsider. Retrieved May 31, 2015. ^ "Matt Striker Joins Championship Wrestling from Hollywood Announcing Team". ^ "SAMOA JOE VS. WILLIE MACK, MICK FOLEY MYSTERY AND MORE NEWS". PWInsider. Retrieved May 31, 2015. ^ a b "16 Carat Gold 2014 Tag 2 – die letzten 4 stehen fest". Westside Xtreme Wrestling (in German). March 16, 2014. Retrieved March 16, 2014. ^ "wXw 16 Carat Gold 2014 – Tag 3 ~ Ergebnis-Ticker!". Cagematch. Retrieved March 16, 2014. ^ "Jr.Heavy Tag League". Pro Wrestling Noah (in Japanese). Retrieved August 2, 2014. ^ Johnson, Mike (September 6, 2014). "First Lucha Underground taping for the El Rey network tonight, updates on all we know". PWInsider. Retrieved September 6, 2014. ^ Wood, Donald (June 22, 2016). "Matt Striker Talks Lucha Underground, WWE and Memorable Moments". Bleacher Report. Retrieved June 2, 2017. ^ Fishman, Scott (May 22, 2015). "PRO WRESTLING: AAA, Lucha Underground's Dorian Roldan Peña discusses Lucha Libre World Cup pay-per-view". Miami Herald. Retrieved June 2, 2017. ^ Caldwell, James (July 28, 2015). "AAA NEWS: Who will call AAA's "TripleMania" PPV in English?". PW Torch. Retrieved June 2, 2017. ^ "GFW NEWS: Report - Jim Ross's commentary partner for Jan. 4". PW Torch. Retrieved May 31, 2015. ^ Meltzer, Dave (October 2, 2015). "Fri update: John Cena taking time off, Johnny Hendricks hospitalized". Wrestling Observer Newsletter. Retrieved October 2, 2015. ^ Velten, Dan (December 18, 2015). "Late news updates from Friday 12/18: Taven injury, weight issues, Tokyo-Dome, NXT". Wrestling Observer Newsletter. Retrieved January 6, 2016. ^ Tsakiries, Phil (2004). "ACW Tag Team Title History". Solie's Title Histories. Retrieved June 8, 2017. ^ "海外絶賛流出中のアイアンマンヘビーメタル級王座の動向＜3月31日分＞". DDT Pro-Wrestling (in Japanese). Retrieved April 2, 2017. ^ a b c d "Title History". CageMatch. Retrieved June 8, 2017. ^ "Pro Wrestling Illustrated Top 500 – 2006". Pro Wrestling Illustrated. Wrestling Information Archive. Archived from the original on February 6, 2007. Retrieved June 28, 2008. ^ "「第8回日テレG+杯争奪ジュニア・ヘビー級タッグリーグ戦」各賞発表" (in Japanese). Pro Wrestling Noah. August 3, 2014. Retrieved August 3, 2014. ^ "WCWC Pacific Northwest Championship". Wrestling-Titles.com. Retrieved August 10, 2017. Wikimedia Commons has media related to Matt Striker.